Resist is used to draw the outline of an image on silk. These metallic resists hold fine, crisp lines that do not spread. The consistency is perfect for production screen printing, brushing or squeeze-bottle application. 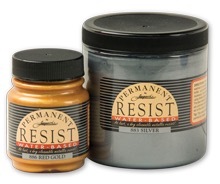 Permanent Water-based Resists are non-toxic and odorless and completely washfast after heat setting.